Do you know someone who does an outstanding job promoting local agriculture? A fabulous restaurant that features in-season, locally sourced produce? A community-based organization that contributes to local food? Nominate them for the Golden Beet award! 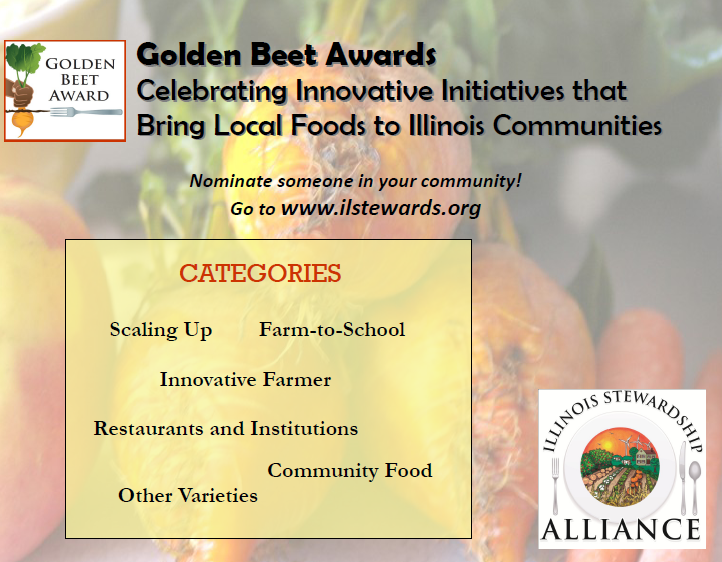 Intended to recognize local people, organizations, businesses that cultivate local food, the Golden Beet is given by the Illinois Stewardship Alliance to recipients who exemplify innovation and achievement in the realm of local food! Read more about this year’s Golden Beet awards here, and learn more, including how to nominate your favorite local food business, organization, or person, on the ISA’s website.